Established Sou Fujimoto Architects in 2000. Based in Tokyo and comprising over 30 architects, designers, craftsmen and thinkers, the studio operates in the fields of architecture, urbanism, research and innovation. Their services are diverse and rigorous, filled with imagination and cutting-edge ideas. The studio has designed houses, temporary installations, and medical and cultural facilities around the world. Fujimoto became the youngest architect ever to accept an invitation to design the temporary Serpentine Gallery Pavilion in Kensington Gardens, London, 2013. The Japan Pavilion at La Biennale di Venezia, in which he also participated, was awarded the Golden Lion in 2012. 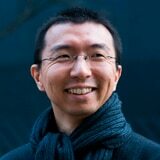 His most important works include the Serpentine Gallery Pavilion 2013, House NA (2011), Musashino Art University Museum & Library (2010), Final Wooden House (2008) and House N (2008).